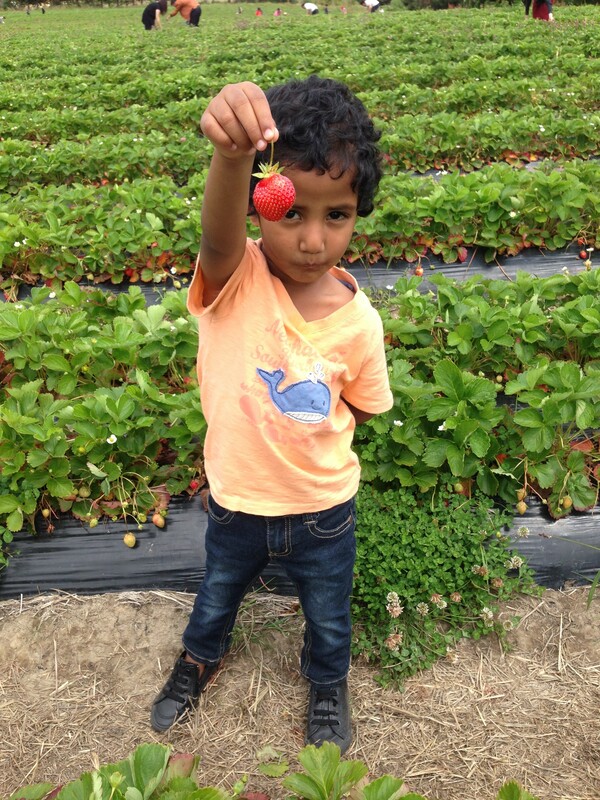 This summer we hoped to visit strawberry farms around the city to experience PYO ( pick-your-own). Although we don’t particularly like eating strawberries, we figured it would be a good outing doing something fun with our little one. So I searched for any farms that are offering PYO around the city. Google suggested a couple of farms, one of which is very close to the city which is why I deliberately avoided it. So we choose another farm located a bit farther west named Phil Greig Strawberry Gardens. This garden is right on the state highway 16 en route to Kumeu. It is very easy to identify the place with big enticing hoardings advertising PYO, ice cream, smoothies and coffee. There is a plenty of parking available. Entry costs $7.5 upfront per adult which includes the first KG of picking. Children under 12 go for free. We are allowed to eat the fruit while picking. Any picking that weighs more than a kilo should be paid for at the rate of $7.5 per kilo. After paying the entry fee, they give a bucket wrapped from inside with a polythene cover to collect the picked berries. The farm is quite big with so many rows of plant beds so it has plenty of space for everyone. 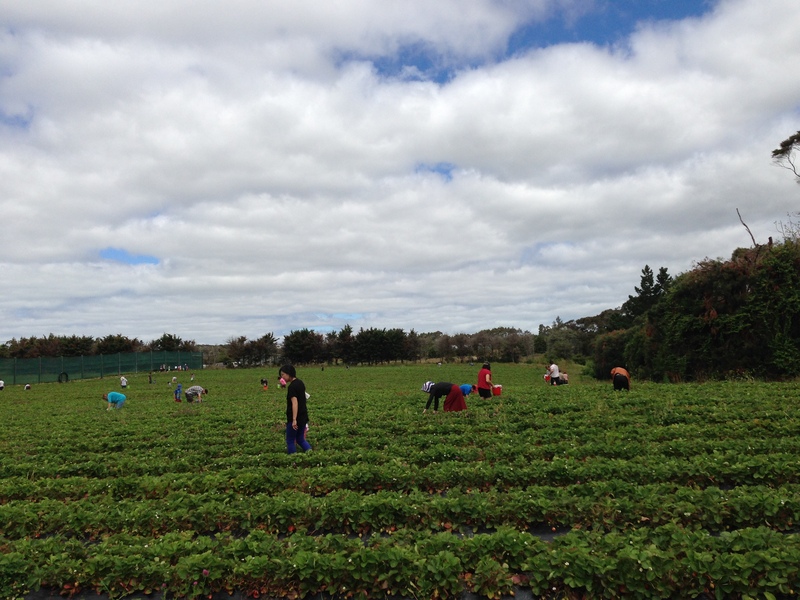 There are good number of fellow pickers mostly mums and dads with their children, spread across the farm. Thanks to today’s temperate weather. While entering I was a bit skeptical about finding the berries as I learned that they allow PYO only after the major crop has been harvested. However I became excited after finding the first couple of berries. The pathway between the plant beds is very narrow so had to walk a bit carefully. The berries are mostly concealed under the leaves. There are berries of all sizes including some unripened green ones and flowers. The small red berries are really sweet. In fact, I don’t particularly get excited about eating strawberries but those tiny ones made me rethink. After about an hour and covering many rows of plant beds, we collected almost 2 kilos of fruit so we didn’t need to pay anything extra. While leaving we stopped by the enclosed ice cream shop . All the ice cream is strawberry flavoured. Though I could not eat due to my participation in The Quantified Diet Project, my wife and son had it. Apparently the ice cream is good but not good enough to break my streak. So I saved my ice cream for later. So that’s our first time picking experience. It is so much fun to pluck the fresh and live fruit off the plants. 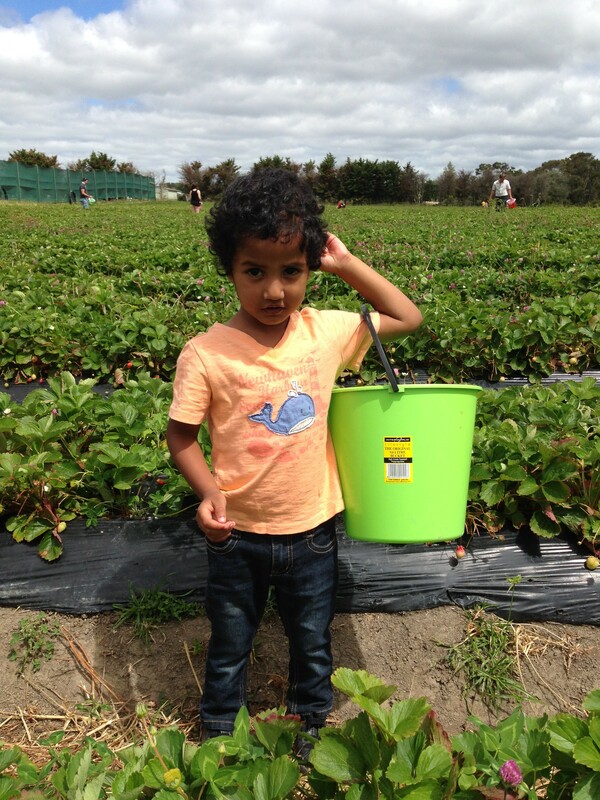 Most importantly our little one enjoyed a lot pointing the berries and asking us to pick. The aroma of farm fresh strawberries is awesome. We definitely look forward to do this next summer.